All the designs in this variety pack fit the 5x7 hoop. 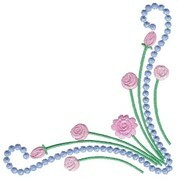 There are two peony designs, two little blue flower designs, and four candlewick designs teamed with grub roses. 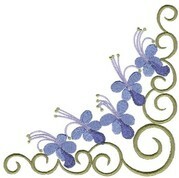 The beautiful peony designs will add a country or eastern charm to any project. Stitch density is low, making the designs look almost hand painted! 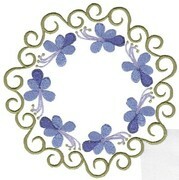 The delicate and unusual little blue flowers have a wonderful classical appeal! 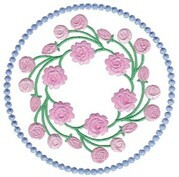 The corner can be stitched and rotated for times to form a large block into which the wreath could be stitched, for a stunning cushion or quilt block. 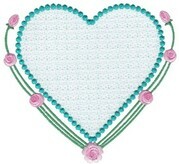 The delicate candlewick and rose designs will add an antique charm to any project! Beware, stitch density for these four designs is high, so take care to stabilize your fabric thoroughly!